Richard Rapport is a chess prodigy who has taken the world by storm. He gained the Grandmaster title at the age of 13 years and 11 months old, breaking the world record for youngest Grandmaster in history. Using his unorthodox and aggressive style, he is always a fan-favorite at any tournament that he plays in, and now that he has recently broken the 2700 rating barrier, he is sure to be invited to increasingly strong tournaments very soon. This kid has all the makings of leading the new generation of chess players and being one of the best in the world one day. Richard Rapport learned to play chess from his father at the age of 4. He began to play in competitive tournaments in 2006 when he was 10 years old. He quickly began to shine as he won the U-10 section of the European Youth Championship in the same year. In 2007 he won the U-12 Hungarian Boys Championship, only giving up 1 draw in 9 rounds. In 2008, Rapport became a FIDE Master and also won the First Saturday July IM Tournament. He quickly continued to progress and in 2009 he became an International Master. In the same year he also came in second in the First Saturday GM Tournament in August. In 2010, Rapport won the First Saturday GM Tournament in February, defeating all four of the Grandmasters who played in it, and he also achieved the Grandmaster title in the same year. He was the world’s youngest Grandmaster at the time, only being 13 years and 11 months old. After getting the Grandmaster title, Rapport continued his meteoric rise, gaining rating points in almost every single tournament he played in. He started off 2013 by winning the Tata Steel Group B tournament and this valuted his rating into the top 100 list. 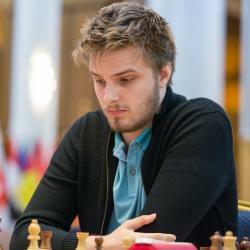 In 2013 he also won the Sigeman & Co tournament and the European Rapid Championship. He was invited to play in the 2014 Tata Steel Group A tournament section but had a bad result against his toughest competition, using his unorthodox and aggressive playing style. Recently he has broken through the 2700 rating barrier with a best rating of 2701. He is the best U-18 player in the world and is now known as a super-GM. He will definitely continue his rise and within a few years will be challenging the best players in the world on even-footing.